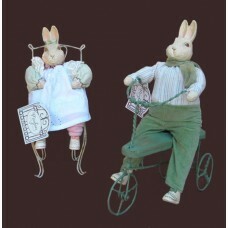 These are classic Easter, or just country decor, reminiscent of days gone by. Unique & collectible. Size of "Francis Hare" on metal Tricycle: 8 1/2" W. x 10 1/2" H.-- Size of "Madi May" Sitting Pretty on metal chair: 9 3/4" H. 4" D.-- Indicate your choice below; Buy both and save $5.00!! !